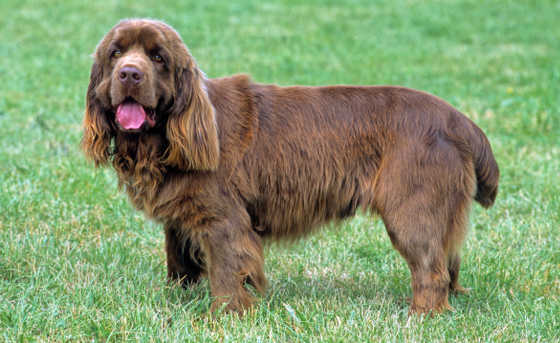 Today we are adding the Sussex Spaniel to our Breed Library. The Sussex Spaniel is one of our rarest gundog breeds. At first glance, he bears a passing resemblance to a liver coloured cocker. Similar in conformation to the Clumber Spaniel, and a little shorter in stature, the Sussex is however, a heavier, more substantial dog than the cocker. And slower in pace. 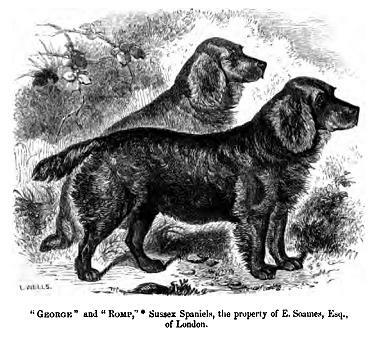 The Sussex spaniel’s origins can be traced back as far as the early part of the 19th century. The sketch to the right was made in around 1859. The Sussex Spaniel Association was formed in 1924. Very low numbers within an isolated population are always a problem for dogs. All the Sussex Spaniels in the UK today are descended from the ten dogs saved by Joyce Freer. Severely restricted gene pools increase the risk of inherited disease and whilst generally a fairly healthy breed, there are a number of problems to which the Sussex Spaniel is susceptible. The Sussex Spaniel Association states that the breed mean hip score is 37 which is pretty dismal, so if you are buying a puppy, make sure both parents are scored and have much better results than this. The SSA also mention allergies, bloat, and ear problems (common in all floppy eared dogs) as a potential issue. Heart problems can occur, and a spinal problem called ‘intervertebral disc syndrome”. The Sussex Spaniel Association notes that the Sussex Spaniel is a guarding breed and can become possessive with their owners. Extensive socialisation is therefore particularly important, and the Sussex Spaniel may be a less extravert character than some of his cousins from our other spaniel breeds. Originally bred as a working spaniel, the Sussex Spaniel is noted for his tendency to noise whilst hunting. This may have contributed to him falling out of favour as a working spaniel, silence in the field being generally considered a virtue by our modern shooting community. The USA currently has the largest population of Sussex Spaniels, and in 2009 a Sussex Spaniel won best in show at the prestigious Westminster Show, the equivalent of our Crufts. If you are looking for a genuine working spaniel, this might not be the dog for you, but if you like the idea of an unusual pet, the Sussex Spaniel is one to consider. 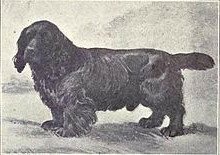 It has a small but dedicated following and whilst the long term future of such a rare breed is uncertain, the Sussex Spaniel is likely to be around for a good while yet.